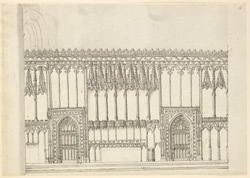 An elevation in ink of St Cuthbert's altar in St Alban's Abbey church in Hertfordshire. St Cuthbert had been the abbot at the monastery in Lindisfarne in the 7th century, at the time that the Lindisfarne Gospels were being created. Cuthbert's remains were removed from the island in the 8th century, when the monastery came under Viking attack. His body was eventually interred in Durham cathedral, but many other villages and towns in the north-east of England contain monuments to him, including this altar at St Albans.